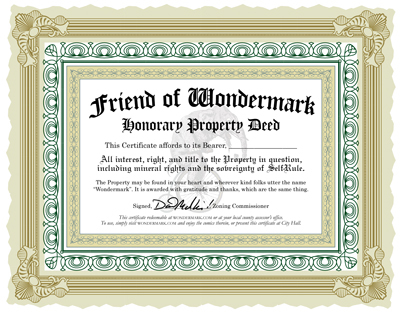 Wondermark » Archive » The new books are in! So I made a contest! The new books are in! So I made a contest! 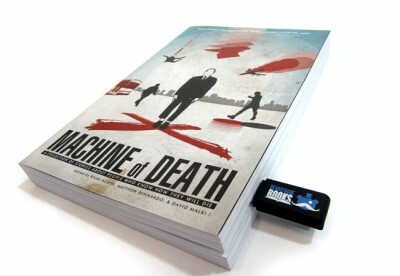 This book is my longest yet — about 15% longer than the previous hardcover volumes. 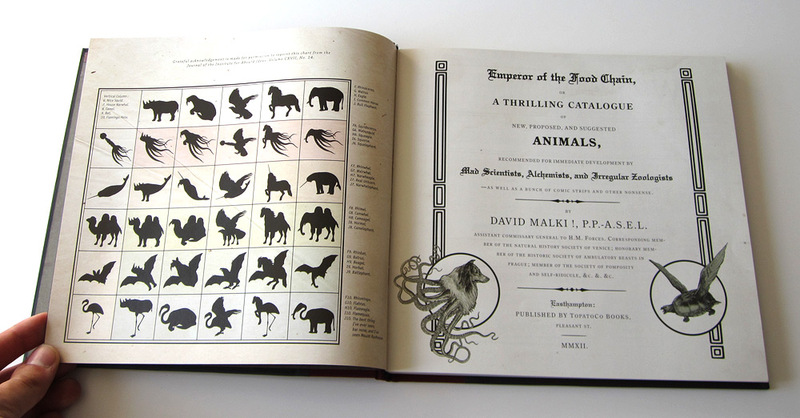 It’s full of comics, of course, but also elaborate digressions, the long-form “The Gax of Life” short story, a Piranhamoose children’s book, and tons of other fun stuff. It was so much fun to make and I’m so glad it’s here! It came out gorgeous. 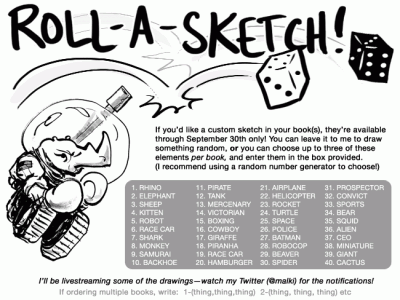 For a limited time I’ll also draw in your books! 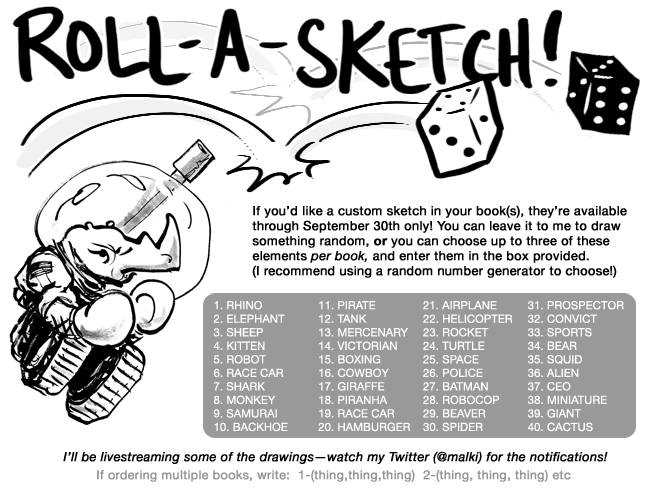 I’m taking the Roll-a-Sketch idea and adapting it — you can choose up to three strange elements from a list (ideally at random), and I’ll create a drawing that combines them. This option is available on the book’s purchase page. UPDATE: This is over now, thanks everyone! 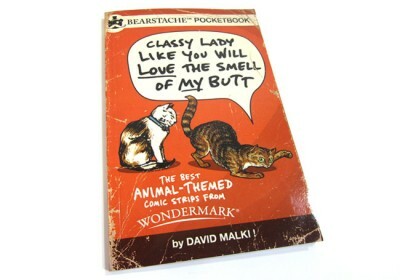 If you’ve never picked up any of my books, here’s a special treat for you! My first couple hardcovers are out of print, but we’ve saved a few just so we could offer a 5-pack of books once the new one arrived. 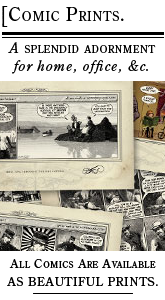 To begin with, we’re only offering the 5-pack as sketched-in Artist Editions: UPDATE: These are also gone! 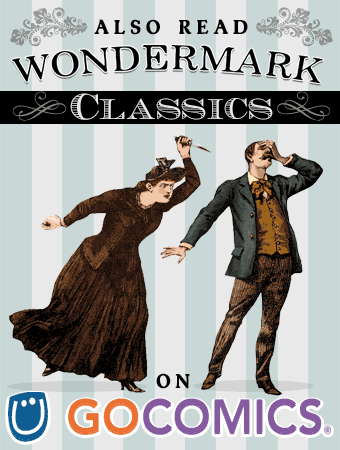 And I’ve lowered the prices on some of the other books too: The Annotated Wondermark is now only $8. 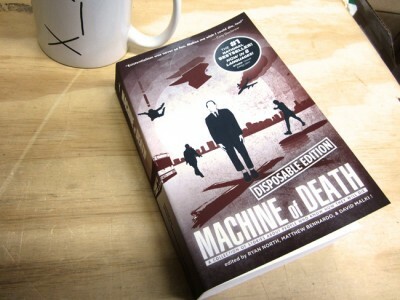 Dispatches from Wondermark Manor, the Tweet Me Harder book, and Machine of Death are all now only $15. 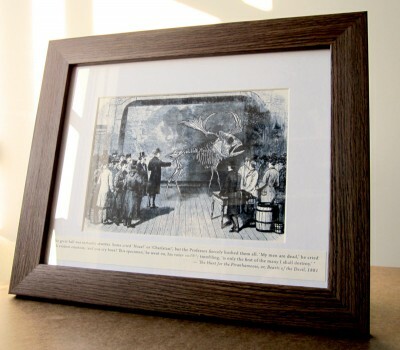 If you pick up any of the Wondermark books — the new ones or any of the older ones — between now and the end of the month, you can enter a giveaway for prizes! You could get a copy of one of my personal favorite humor books, or I could make you a Zimbabwean trillionaire. 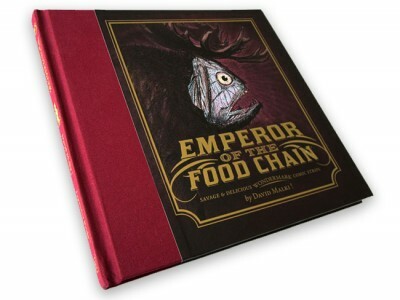 Or you could win a bunch of my personal working notes for the new book, Emperor of the Food Chain. UPDATE: This is also over. Based, of course, on the stunning poster by Carly Monardo that we’ve offered for some time. The MOD Disposable Edition is now the cheapest way to get MOD in print, and it’s even available in bulk rates for book clubs, classes, and gift-giving bonanza time. 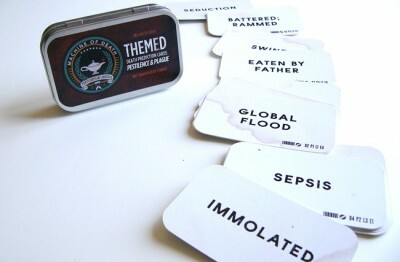 Finally, we’ve added two new sets to the MOD Death Prediction Card tins. 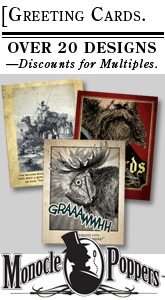 Above are some sample cards from the new “Plague & Pestilence” set of death cards, representing premodern deaths, from the caveman era to the Victorian era. There’s also a new “Deck C” expansion pack, full of more general-purpose deaths for your various prediction needs. • Buy the new book today, and have me sketch in it for you. • Enter the contest to win prizes. • Grab a T-shirt, thumb drive, or Disposable MOD while you’re shopping. Thanks so much for your support! 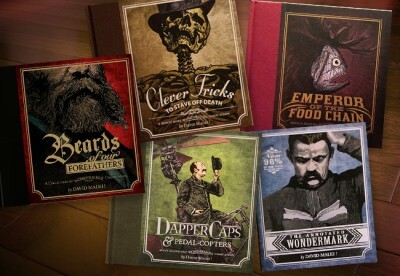 These new books and products are all done without the benefit of a major publisher. 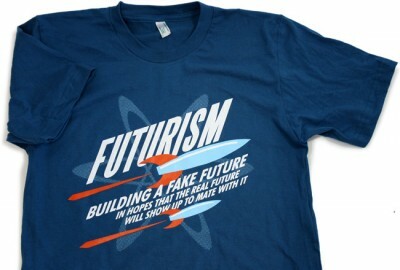 They’re not in bookstores or retail outlets, and we have no budget at all for promotions or publicity. You guys are the front lines and I appreciate every kind word and compliment! I have a ton of fun putting this stuff together and I can’t wait for you to see it all in person. This entry was posted on Monday, September 17th, 2012 at 11:55 pm and is filed under Blog. You can follow any responses to this entry through the RSS 2.0 feed. Both comments and pings are currently closed.